March is wrapping up, and D.C. is mad for basketball and cherry blossoms. Peak bloom is right around the corner, according to forecasters — That also means that many trees are already flowering. 1839 7th St. NW Washington, D.C.
Buffalo Billards(1330 19th St. NW)sells $22 buckets of Bud Light during every game. Tommy Joe's (7940 Norfolk Ave., Bethesda, Maryland) has a selection of bar food specials, $3 Blue Moon drafts and discounted pitchers during all games alongside daily happy hour from 3 p.m. to 7 p.m. The Big Stick (20 M St. SE) is selling 50-cent wings all throughout the tournament. The Ugly Mug (723 8th St. SE) on Thursdays through Sundays during the tournament has $4-5 pints and $30 Miller Lite towers. Union Pub (201 Massachusetts Ave. NE) on every game day offers $14 Bud Light and Union Pub Lager pitchers, $15 Bud and Bud Light buckets and $13 Carlsberg buckets, along with its daily specials. Friday, 7:30 p.m. and Saturday, 7:30 and 10 p.m.
Catch up-and-coming comedians audition for Montreal's prestigious Just for Laughs Comedy Festival. Start your day with some yoga then dance until 9 a.m. Organizers suggest wearing florals and cherry blossom pinks. Tickets for the dance portion cost $25 plus fees. Celebrate Francophone culture, film, food and drink. Tickets cost $40 and include two hours of samples. 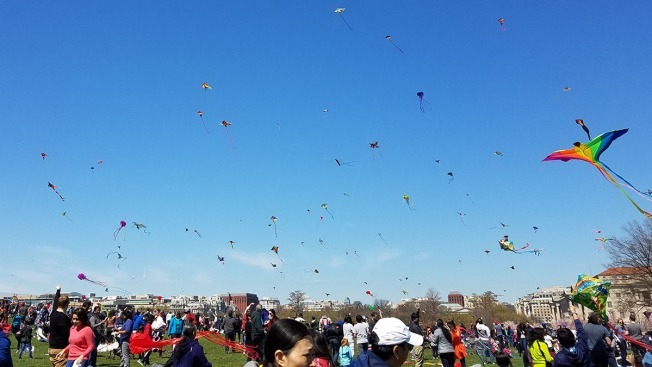 Bring your own kite or let you child make a kite at the annual Blossom Kite Festival on the grounds of the Washington Monument. See the spring sky filled with colorful kites. This event is free. The Freer|Sackler galleries are set to open "Empresses of China's Forbidden City, 1644-1912" this weekend with a celebration fit for kings and queens. Taste recipes from the Chinese imperial court, listen to classical music performances or enjoy gallery talks in Mandarin and English. There are kid-friendly activities, too. Binge-watch films from visionary women, beginning with a collection of films from 1912-1925 featuring the first female filmmakers. Discussions will be held with experts after many films. No tickets are required for the festival. Enjoy traditional Japanese drumming performances all day. Kawaii refers to the culture of cuteness in Japan, and this meet up allows newbies to score some of their first J Fashion outfits. There's a $15 entrance fee. If you have items to sell, tickets are $25. A collection of artists will display their work exploring Earth's ecosystems. Organizers suggest a $5-10 donation for entry. It's kid-friendly until 9 p.m.